ok, I'm sorry but this made me totally giggle. You have a semi-serious side effect and yet, you're most worried about people wondering about your mental health!! hehehe!!! Im pretty sure your doctor wont commit you for this one lol. It actually is a nervous twitch that believe it or not I share (never thought of it as quacking til you said that though...I always thought of it as a cluck lol) It happens when I'm extremely tired and or stressed and is a result of some minor damage to my nervous system. Yours is probably just a side affect of the medication. Talk to your doc and it'll go away with a new med or since you now know you are not alone...Nervous Cluckers/Quackers of the World Unite!! It appears you are talented on more levels than I ever imagined were possible. Cograts. If it sounds like a duck, its probably a hunter with a duck call who wants to kill ducks with his gun. Or her gun, as the case applies. Or it could be a bipolar Diva, who has been quacked up for years, proving how quacked she is. And who should be talking with her p-doc about her meds! OMG!! MY JAW HIT THE FLOOR. You quacked? wow. Maybe its stress/anxiety related. Dare I say, like tourettes. Its your body's way of avoiding violent rage? I imagine that moms want to do that from time to time. I wouldn't worry about it, once you get through the transitional stage and the feathers, beak and webbed feet come in, you won't even remember being a person and you'll be fine! Just kidding, you should have it checked out. Holy crap! 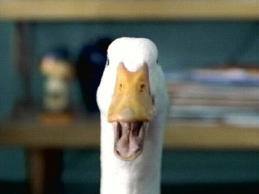 Well, I hope you have Aflack as your insurance to help pay your doctor bills! Please still love me even though I totally giggled. sweet jeezus that is awesome...i have these weird twitches with my meds also, but nobody has noticed them yet. i was pretty sure i was developing parkinsons disease. at least i know that i am being a hypochondriac? seriously, i hope that your doc can help you out...or at least assuage your concerns. I think half of those side effects I'd handle like a baby. I'm not good with pain. You should see me after my trip to the dentist. thebipolardiva@gmail.com and I'll tell you anything you want to know. It would be easier than trying to write it all in a comment. I'm not sure what state you're in but having bipolar isn't a cause to take kids, especially if it's managed and you take control of it. Email me and we'll talk. I know what you mean about side effects, they're a major pain to deal with. Lol don't you just love that you can always count on your kids to catch all the "little" things like that that you do and make fun of you, and lets not forget that they're going to tell every one they possibly can? Gotta love 'em! I hope everything works out for you girl! I love it but then you know I have a thing for ducks! I am so sorry to laugh at your misery, but it was just too damn funny. Although if it was me, I think I would actually enjoy quacking. I would work out a big long story about how I lost my pet duck as a kid and now sometimes when I remember him I just 'quack'. I AM a hypochondriac and if I was on all that medication, I'd for sure be over the top hypo. Wait, maybe I already am over the top hypo? Is that a disease? Ah crap. I hate the medication cocktail. I'm on that medication-go-round side effect vigilance myself. I'm terrible about taking my meds though. Wellll I did recently read that they were hiring someone new to do the Aflack duck voice....maybe a new job opportunity? WHAT in the world???? That's the craziest thing I've heard about in a long, long time! I shouldn't laugh that you quacked..but I did. Sorry! What is it with side effects. You can't take an aspirin anymore without worrying about bleeding from your orifices. Jank! Ugh the side effects. I know what you are up against. One day out of the blue- and ive been on some major med combos lol. I started biting the inside of my mouth/cheek and it looks like im chewing gum, moving my mouth around. Sometimes you dont notice it at all, sometimes its ridiculous how stupid i look and oh yeah, its very tiring to move your mouth uncontrollably all day long. And oh yes, you do develop mouth ulcers etc from chewing your mouth! I'm pretty sure i got it from the Seroquel, and its one of those "tics" that they talk about and guess what, it never goes away! Ever! I do take another med to help it but it only helps a bit. All this and i dont even take the med anymore, didnt work! So, whenever you start developing something that you arent doing on purpose , get it checked out ASAP.